With more than 140,000 words, phrases, and definitions, including a wealth of new words, sample sentences, and usage notes, this marvelous edition makes it easier than ever before to find the correct meaning of a word. The editors have completely rewritten the entries, stressing everyday English to make each definition as accessible as possible. 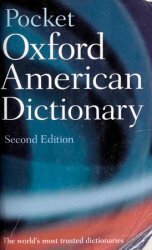 Moreover, they have used the latest evidence from the Oxford English Corpus--a vast database of some two billion words, offering an unparalleled portrait of our language--to uncover the most common and most important meanings of words and phrases in contemporary American English. The editors have also organized the meanings in an entry according to these findings, so that the most likely definition of a word occurs first. In addition, the Dictionary features thousands of real examples that highlight how words are used by recognized writers, and it includes hundreds of usage, grammar, and spelling tips based on evidence of real mistakes. Finally, the Dictionary boasts a new page layout, with a more open and accessible design, with an emphasis on readability. This is an essential resource for people on the go, who need a portable and reliable guide to our language.